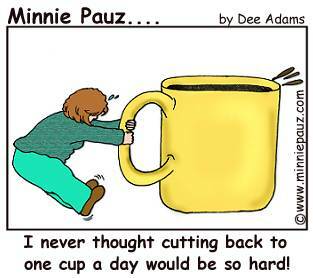 minniepauz.com - Does coffee make menopause worse? First they tell you not to drink coffee, then they say drink MORE coffee! I guess you just have to decide what is best for YOU!! In this cartoon you can see how I handled the situation! On one site they state that coffee can make your menopause experience worse because of the caffeine causing jitters and sleeplessness, even an irregular heart beat and something close to a panic attack. If you already experience these symptoms, it might be a good idea to experiment with drinking decaf, especially after 2-3pm.